With 50-plus years of ongoing service in the printing and mailing industry, our dedication, quality products and customer service has continued to be recognized by various press and media outlets. 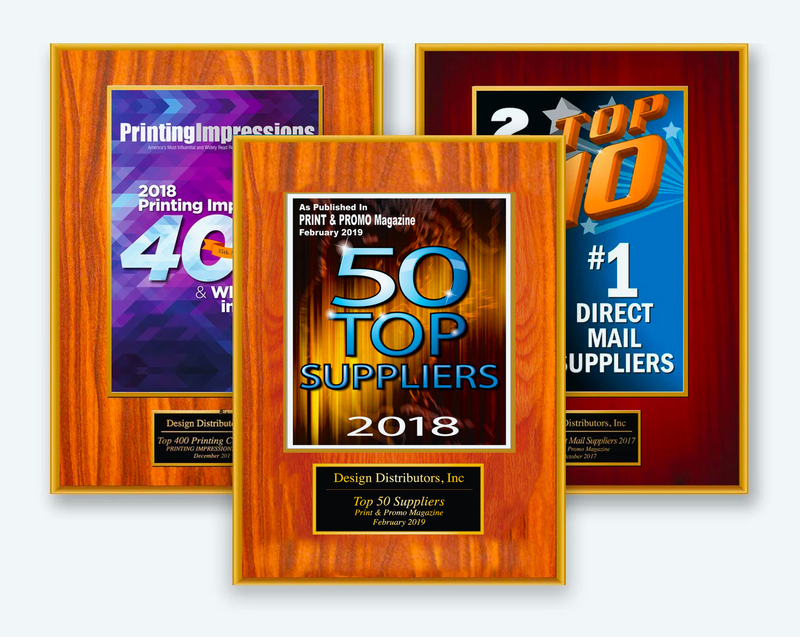 Design Distributors, Inc. (DDI) has been awarded the status of the Top Direct Mail Suppliers in the United States by Print & Promo Magazine, and among the Top 400 Printers in the United States and Canada by Printing Impressions magazine, two of the industries leading resources. This award bears witness to DDI’s ability to maintain continued steady growth without sacrificing its dedication to its clients of providing industry leading customer service. "We are constantly looking for ways to provide our clients with multiple cost saving options to choose from", the company’s President, Adam Avrick states. "We believe that, and our continued efforts to provide industry leading customer service, are the two primary reasons for our continued success." Design Distributors, Inc. (DDI) President Adam Avrick was awarded the prestigious United States’ Postal Services Postal Customer Council’s (PCC) National Industry Member of the Year - Gold Award on Tuesday Aug. 27, 2014 at the PCC’s ceremony held in Washington D.C. This award was received in recognition of his dedicated work, educational innovation, and commitment as Industry Co-Chair of the Long Island PCC Chapter. Mr. Avrick received the award from the US Postal Service Postmaster General/CEO Patrick R. Donahoe. Adam’s stewardship as Industry Co-Chair of the Long Island PCC Chapter, from June 2011 through June 2013, saw a sizable increase in membership, educational programs, and participation at its monthly meetings and events. Design Distributors, is the largest full service direct marketing facility in the New York Area. DDI’s state of the art facility and diversity in equipment allows them to print, image and mail just about every conceivable project. By controlling the complete production cycle, DDI has been able to reduce turn time and add to cost savings by eliminating freight as well as accommodating last minute changes to mail quantities. Variable color imaging and an extensive fulfillment department are just a few of the latest additions to its already diverse plant. Adam truly believes in developing strong open relationships between the USPS and local business mailers. His support of the PCC and their educational seminars has helped keep Design Distributors, Inc. in synch with the USPS as they develop programs designed to streamline the mail industry, benefiting his customer’s direct market programs. The Postal Customer Council is a network of business mailers and representatives of the U.S. Postal Service, who gather regularly to discuss and resolve local mailing issues as well as develop content-rich education programs. On both the national and local levels, Postal Customer Councils work to continually improve communications between the Postal Service and its customers by promoting an effective networking platform. Design Distributors, Inc. (DDI) is proud to announce that it has continued to excel as an industry presence by ranking once again in the Printing Impression Magazine year end listings of the top printers and direct mail companies. For the second year in a row, Design was ranked in the Printing Impression’s Top 400 Who’s Who in Printing (November 2012). Now in its 29th year, the Printing Impressions 400 provides the industry’s most comprehensive ranking of the leading printing companies in the United States and Canada. Company rankings for the current and previous year are based on sales figures reported. Design Distributors was ranked 253 out of 400. DDI, in its 46th year in business, continues to improve it service to the industry and profitability through intelligent production and networking. One of the keys to its success has been its ability to work with their clients and provide not just a printed product but a solution to every issue. This has led to the building of a very diverse 70,000 square foot production facility which can produce just about every conceivable mail piece. Most recently DDI has entered the digital color printing market with the installation of the Xerox I-Gen print production system. The I-Gen is an industry workhorse which allows for accurate full color short run print production in a cost effective manner. This technology is ideally suited for the new Every Door Direct service offered by the US Postal Service. “We are constantly looking for ways to provide our clients with cost saving options to choose from”, the company’s’ President, Adam Avrick states. “We believe that, and our continued efforts to provide industry leading customer service, are the two primary reasons for our continued success”. Design Distributors, Inc. (DDI) has been awarded the status of one of the Top 10 Direct Mail Suppliers in the United States by Print & Promo Magazine, formerly Print Professionals Magazine, one of the industries leading resources. DDI was also ranked in the top fifty printers overall. This award bears witness to DDI’s ability to maintain continued steady growth without sacrificing its dedication to its clients of providing industry leading customer service. DDI, in its 46th year in business, continues to improve it service to the industry and profitability through intelligent production and networking. One of the keys to its success has been its ability to work with their clients and provide not just a printed product, but a solution to every issue. This has led to the building of a very diverse 70,000 square foot production facility which can produce just about every conceivable mail piece. We are constantly looking for ways to provide our clients with cost saving options to choose from”, the company’s’ President, Adam Avrick states. “We believe that, and our continued efforts to provide industry leading customer service, are the two primary reasons for our continued success”. Hauppauge, New York - August 8, 2012 - Feeling frustrated that you don’t have time for charity because you’re too busy at work? Design Distributors, Inc. gave employees the perfect outlet for their frustration – Boss Dunk for Charity! Recently, employees at Design Distributors, Inc., a full-service commercial printing and direct mail company, got the opportunity to dunk their bosses in a dunk tank to raise money benefitting Island Harvest, Long Island’s largest hunger relief organization. Employees and clients donated money for a chance to dunk the top executives at Design Distributors, Inc., with many donating repeatedly to get another chance to dunk the bosses. Adam Avrick, president, Design Distributors, Inc. said, “We choose Island Harvest as the beneficiary of the event because we know the money will go directly to getting food to those in our local communities who are struggling in these difficult economic times.” Design Distributors, Inc.. matched all donations made during the 2 hour event, donating a total of $1600 to benefit Island Harvest. Now in its 20th year, Island Harvest serves as the bridge between those with surplus food and those who need it, supplying nearly 570 community-based nonprofit organizations on Long Island with critical food support to help stem the advancing tide of hunger in our communities. For more information about Island Harvest, visit www.islandharvest.org. For more information on Island Harvest, please see the website at www.islandharvest.org. Donations can be made on their site and are greatly appreciated. Design Distributors, Inc. (DDI) has been placed among the Top 400 Printers in the United States and Canada by Printing Impressions magazine, one of the industries leading resources. This honor is testament to DDI’s ability to attract business to its one-stop manufacturing facility and produce quality printing along with uncompromised service for our growing customer base. DDI’s facility is the most diverse one-stop, all in-house printing and mailing facility in the northeast. By equipping ourselves with a complete pre-press department, high end digital proofing, on-site web and sheet-fed presses, finishing, lettershop and fulfillment areas, our loyal customers have seen the efficiency and cost savings DDI offers. DDI’s president Adam Avrick attributes the company’s strong positioning in the listing to a concentration on customer service and offering alternative products to our clients. DDI was founded in 1966 as an envelope printing company and expanded over the years to a full service commercial printing and direct mail company occupying 75,000 square feet of company owned space in Deer Park, New York. Recently DDI has expanded into the contract packaging and fulfillment business. DDI has taken over 50,000 square feet of additional space and is providing these services as well to its clients. Design Distributors, Inc. (DDI) has been awarded the status of one of the Top 10 Direct Mail Suppliers in the United States by Print Professionals Magazine, one of the industries leading resources. DDI was also ranked in the top third overall. This award bears witness to DDI’s ability to maintain continued steady growth without sacrificing its dedication to its clients of providing industry leading customer service. DDI recently celebrated its 45th year in business, which was started in the envelope printing business and expanded over the years to a full service direct marketing solutions company. One of the keys to its success has been its ability to work with their clients and provide not just a printed product but a solution to an issue. This has led to the building of a very diverse 70,000 square foot production facility which can produce just about every conceivable mail piece. Most recently DDI further expanded into the contract packaging, fulfillment, and hand assembly areas. By combining hand assembly with various forms of automation, they have provided their clients different options and cost effective means of producing their products. In addition to automation, DDI provides state of the art shipping optimization programs to reduce clients shipping costs while maintaining important in home dates. Adam Avrick assumed the role of Chairman of Printing Industries of Long Island (PIA-LI) on July 1, 2011. Adam has served for two years on the Board of Directors of Printing Industries Alliance (PIA) and has taken on the additional responsibility of heading up its regional group of member firms sited on Long Island. Mr. Avrick is the President of Design Distributors, Inc. (DDI), a direct response printing and mailing company. DDI (www.designdistributors.com) is a family-owned Long Island company founded in 1966. After taking over in 1993, Adam expanded DDI from an envelope manufacturer to a full-service printing and mail marketing facility. Adam is a graduate of Rochester Institute of Technology and was past president of the RIT Printing Alumni Association. He also currently serves as Co-Chairperson of the Long Island Postal Customer Council (LIPCC). DDI is the only true full service printing and mailing company in the Tri-State area, whose capabilities include envelope, forms, commercial printing along with a state of the art digital imaging, fulfillment and mailing facility. Printing Industries Alliance (PIA) is a regional trade association representing the $20 billion printing and graphic communications industry throughout New York State, northern New Jersey and northwestern Pennsylvania. The more than 462 graphic communications firms located within Nassau and Suffolk Counties alone contribute to the Island’s economy with annual shipments of over $2.1 billion and provide 12,812 jobs. Like its parent organization, PIA-LI’s mission is to foster policies which promulgate economic growth on Long Island for both graphic communications-related companies and other firms doing business here, to maintain close working relationships with key corporate and political decision makers at county, state and federal levels, to encourage “buy local” procurements practices, and to protect the overall commercial interests of its members. PIA-LI holds regularly scheduled programs throughout the year in Nassau and Suffolk Counties which are open to members and non-members alike. For membership information on PIA-LI, or if you are simply interested in attending a meeting or an event, please visit its website at www.PIAlliance.org. Adam Avrick will take over the reins as LI PCC Industry Co-Chairperson at the LI PCC monthly meeting on June 15, 2011. Adam has served for four years an Executive Officer for the LIPCC, as First Vice Chair for the past 2 years, and 2nd Vice Chair for two years prior to that. Adam also serves on the board of the Printing Industries Alliance of Long Island. Adam is President of Design Distributors, Inc. (DDI), a direct response printing and mailing company. DDI (www.designdistributors.com) is a family-owned Long Island company founded in 1966. After taking over in 1993, Adam expanded it from an envelope manufacturer to a fullservice printing and mail marketing facility. Adam is a graduate of Rochester Institute of Technology and was past president of the RIT Printing Alumni Association. DDI is the only true full service printing and mailing company in the Tri State area, whose capabilities include envelope, forms, commercial printing along with a state of the art digital imaging, fulfillment, and mailing facility. The Postal Customer Council is a network of business mailers and representatives of the U.S. Postal Service, who gather regularly to discuss and resolve local mailing issues as well as develop content-rich education programs. Postal Customer Councils work on both the national and local levels, to continually improve communications between the Postal Service and its customers by promoting an effective networking platform. The mission of the PCC program is to foster and maintain a close working relationship between mailers and the United States Postal Service, share information about new and existing Postal Service products, programs, regulations, and procedures, facilitate the interchange of ideas among mailers and Postal Service officials and help members and their organizations grow and develop professionally through focused educational programs. Aside from the high quality marketing materials we produce, the number one reason our customers stay with us for years is our attention to detail and customer service. Whether we do business together already or you're looking to begin a relationship with Design Distributors, we're anxious to speak with you. Here at Design Distributors, each new project gets assigned to a trained and dedicated professional to further assist and keep in touch with you every step of the way. To learn more about our services, inquire about your existing project or discuss an upcoming one, please contact us or request a quote. Direct Mailing tips straight to your inbox.